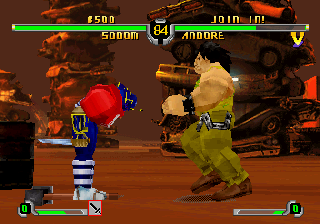 The above control scheme is the default setting in the SEGA Saturn version. You can change the button layout in the options menu. which includes options to make the L and R shoulder buttons do things. 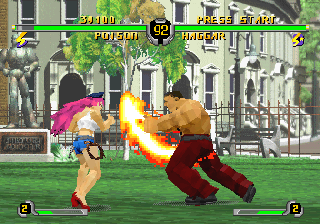 Previous Final Fight games were scrolling beat 'em ups, but Final Fight Revenge is a one on one fighting game. 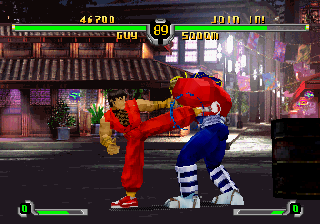 Use punches, kicks, throws, special moves and more to defeat your opponent. 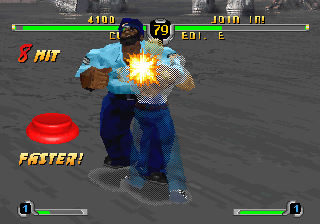 Each character has a life bar, whoever's is depleted first will lose the round. The default setting is a best 2 of 3 rounds system, although this can be changed in the options menu. If the time limit runs out before a character is knocked out, whoever has the most life in their bar will win the round. 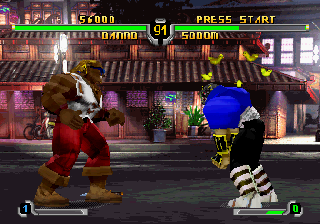 Each character has several moves they can only do when at least one bar of super combo gauge is available. These super moves can do lots of damage to the opponent. 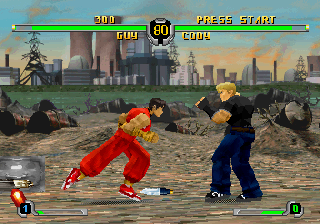 The super combo gauges are located at the bottom left of the screen for player 1, and the bottom right for player 2. By attacking the opponent, these gauges will fill up, to a maximum of 3 levels. To block, hold back. To block low attacks, hold down back. You can block just about anything apart from throws and command throws, such as Haggar's spinning pile driver. You will not take any damage whilst blocking standard punches or kicks, but you will take a very small amount of damage when blocking special moves and super combos. You cannot block in the air. To dash, double tap back or forward depending on which direction you want to go. To throw the opponent or get them in a hold, get close to the opponent, hold back or forward, and then press either the fierce punch or roundhouse kick buttons. 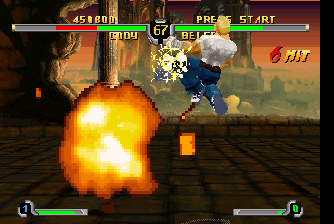 Some characters also have air throws, which can be used when both characters are jumping. You cannot block throws. 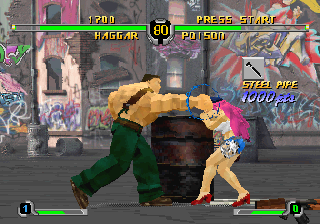 If both players attempt to throw each other at the same time, neither player will be thrown and instead the characters will push away from each other. Pressing the sidestep button will make your character move into the foreground. 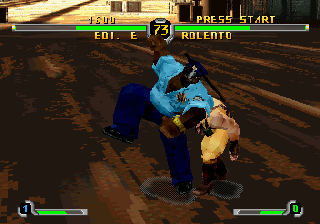 By holding down and pressing the sidestep button, your character will move to the back. This is useful for avoiding the opponent's attacks. To pick up an item, stand over it and press the pick up item button (which is the same button as the sidestep). Your character will pick up the item. If the item is a food item, this will increase your life gauge. If the item is a weapon, press the fierce punch button to use it. There are many types of weapons in the game, each with a limited supply of ammo or uses. If you repeatedly manage to hit your opponent with attacks within a few seconds, they will be stunned. This means that they will briefly be unable to move or block, so you've basically got the chance to get in a free combo. If you are stunned, press every button to shake off the stars faster. To taunt, just press the taunt button. Be wary though as you cannot cancel a taunt animation and some character's taunts go on for longer than others. 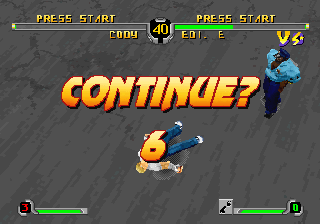 If you lose in the arcade mode, you will be given a few seconds to continue (you have infinite continues). If you don't continue the game will end and return to the title screen. 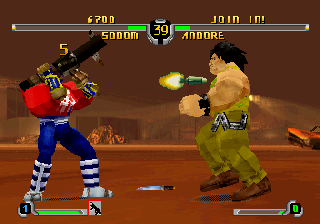 Belger is the last opponent you'll face in arcade mode. 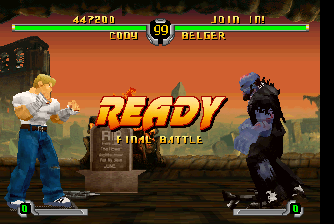 After he was sent flying out of a tower at the end of the original Final Fight, Belger is back...but now he's a zombie! His most devastating move is his super combo. He only has one super move, but it is the most powerful one in the game. 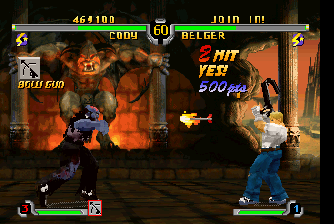 Belger will simply destroy himself, causing his body to blow up and send his limbs flying towards you. These will also blow up. If you are right next to Belger when he does this move and you don't block, get ready to be hurt! 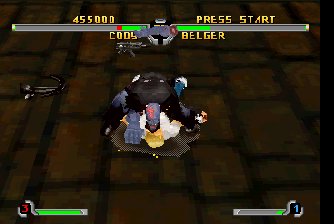 Belger's special moves include an attack where he leaps towards you, pinning you to the ground and then chomping on you a couple of times. This does quite a bit of damage if it hits, but you can hit him out of his leap if you time it right. Another good move he has is an acid spit. He'll lie down to do this move, so block or jump the projectile. 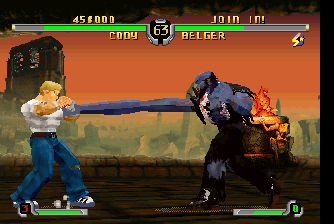 If the spit hits, it will stun you, and Belger will usually follow it up with his leap attack. Belger now has extending limbs, so even if you try to keep away from him he can hit you. But really he's not that difficult to beat, the main things to be wary of are his super move and acid spit. 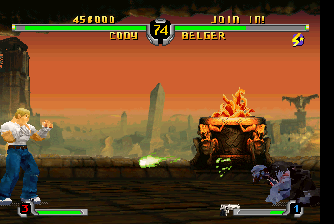 Belger's stage has a weapon exclusive to it: the bowgun, which can shoot flaming arrows.